Marvin Stanton was born in upstate New York in 1850 and educated at Alfred University. In 1867, he moved to Detroit. Similar to many other entrepreneurial men, he grew prosperous as Detroit's favorable location helped it become a leading industrial center. Stanton manufactured and sold men's clothing in Detroit in the later decades of the Nineteenth Century. He was also active in civic affairs and served the city both as commissioner of public lighting and as police commissioner. 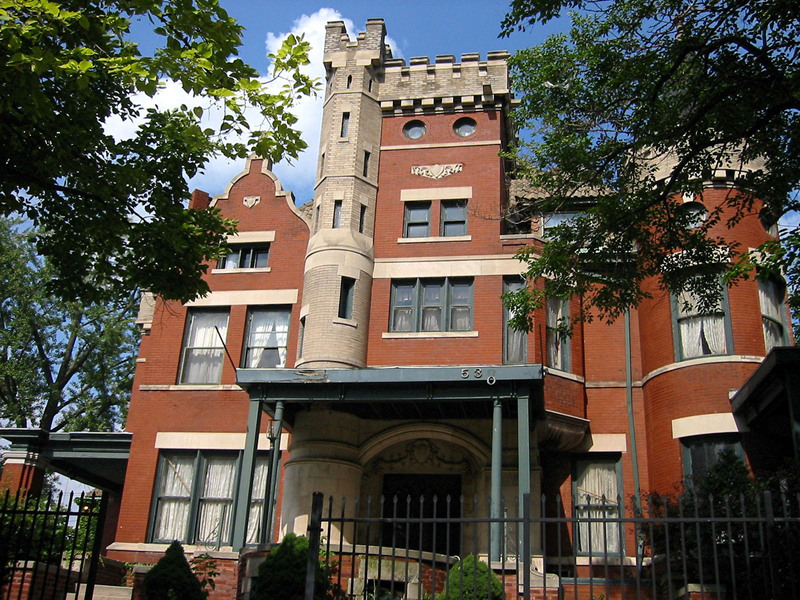 David Whitney and Colonel Frank Hecker used their fortunes to construct castle-like homes built fo r themselves along prestigious Woodward Avenue toward the end of the Nineteenth Century. 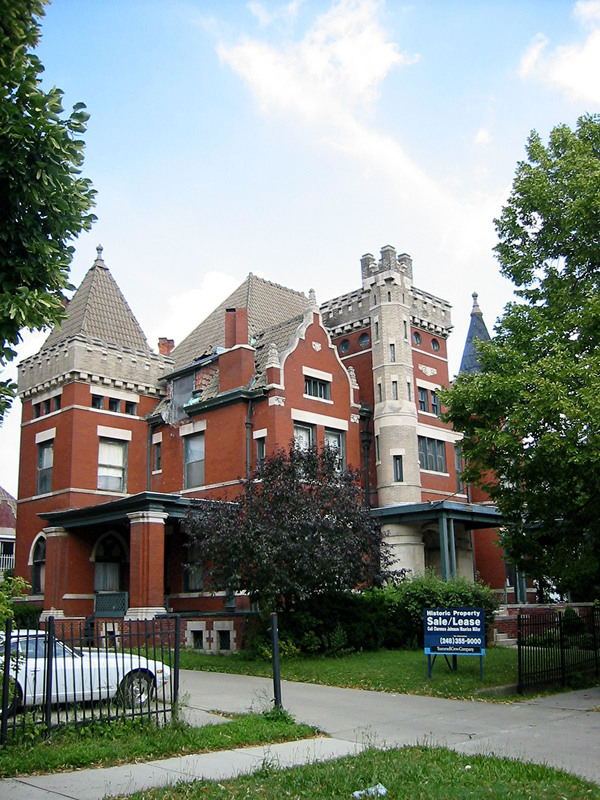 Both of them commissioned accomplished architects, Gordon Lloyd for David Whitney, and Louis Kamper for Colonel Hecker, to design attractive massive homes in the late medieval castle style. I do not know if Marvin Stanton had different tastes in architecture or if he just wanted his own idiosyncratic interpretation of a castle. In any event, he commission Louis Kamper to design the structure that you see. It is an eclectic array of roof lines, turrets, crenulations, and other decorations. I believe that many see this building as less architecturally appealing than the castles that Whitney and Hecker erected for their homes. Nevertheless the selection of red brick and cream stone lentils was a pleasing one. Seen from the correct angle, on a sunny day with shady trees slowly swinging, you can get quite enthusiastic about this unusual structure. This 13,500-square-foot home has an advantage that the homes on Woodward lack: the back yard abuts a canal now known as Stanton Canal, so the owner of this abode may walk directly to a yacht and sail the lakes and oceans. Marvin Stanton lived in this home from its construction in 1898 until his death in 1908. Apparently, his heirs wanted something different and undertook remodeling, but that may not have improved its appearance. In 1911, his relatives or heirs added a huge structure toward the rear of the property, but it was constructed so as to be very visible from Parkview. This looks like a carriage house similar to the immense ones you see at the Hecker and Whitney properties. This home was vacant for some years in the last quarter of the Twentieth Century, but also served as a bed and breakfast and, I believe, as a restaurant. It was placed on the market in 2003 with an asking price of about $830,000. The city tax assessor, however, simultaneously listed its worth at $150,000. Use in 2009: I am uncertain. I believe the two properties may have been sold separately and no longer have access to the waterway.